What does Apple have in mind for a larger tablet? It seems that a larger version of the Apple iPad has been on everyone’s wish list for a long time. Could it be that Apple is working on a 12-inch version of its iconic tablet? The media has long thought the name for a large-scale version of the iOS device should be the iPad Pro. However given that Apple last year launched the iPhone 6 Plus, the large tablet could be called the iPad Air Plus or simply iPad Plus (according to this website). This would mean that the iPad Pro or iPad Air Plus would take its design cues from the iPad Air with thin bezels and a slim chassis. It would need this as the rumoured 12.9-inch display would make this a monster of a tablet. Around the middle of 2013 saw the first signs of Apple working on the iPad Pro. With Apple and IBM announcing that the two would work together to tailor the iPad to the needs of enterprises, rumours started giving credence to the idea that a larger tablet would see the light of day. It is thought that development of the tablet was being carried out until early 2104, when the plans were shelved in order to working the iPhone 6 and iPhone 6 Plus. In August 2014, Bloomberg reported that Apple would launch a larger-display device in early 2015 in order to boost flagging sales of the iPad range. But in October, the Wall Street Journal reported that this was once again off he cards as factories needed to make more iPhone 6 Plus devices, as that had become an unexpected success. So far, KGI Securities analyst Ming-Chi Kuo has suggested that making this large display would be more difficult due to component yield problems. This in turn would push back the tablet’s launch until later this year. Latest reports have Apple instructing its suppliers to start mass production in September in preparation of a launch after that. 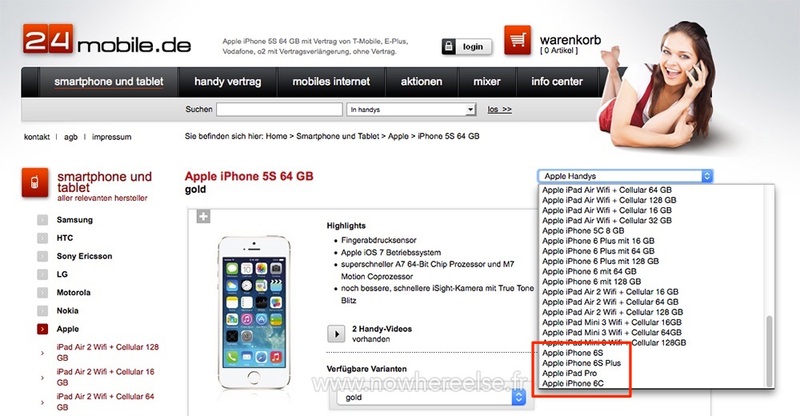 A screenshot from French Apple blog Nowhereelse, has the iPad Pro listed along with the unannounced iPhone 6s and iPhone 6c. According to reports from Macotakara, the larger device could sport speakers and microphones along the top and bottom edges of the display. IBtimes AU said that the iPad Pro will have not one, but four speakers. A 3D cutout has speakers at the top and two at the bottom. The report also claims that the display will measure 12.9-inches with dimensions measuring exactly 305.70mm x 222.60mm x 7.20mm. As with other iPad tablets, it will also come in several variants like 16 GB, 32 GB, 64 GB and 128 GB options. As mentioned earlier, the iPad Pro will take on many of the design cues of the iPad Air, such as an ultra-thin chassis and thin bezels. The iPad Pro may not be as thin as the iPad Air, measuring in at 7mm, compared with the 6.1mm of the iPad Air. It was originally thought that the iPad Plus would boast the triple-core A8X processor that was announced with the iPad Air 2. It is now thought it will ship with the next-generation A9 processor instead. This would tie in with the upgraded iPhone 6S and 6S Plus sporting the updated processor. We can also expect to see the iPad Pro with 2GB of RAM that is seen in the iPad Air 2. It is also thought that the iPad Pro will sport a 2K-capable screen (2,048 by 1,536), the same as the iPad Air 2. Some rumours have the display running at 4K. According to a report from 9to5Mac, citing people familiar with matter said that Apple is working on a dual-app viewing mode for 12-inch iPads, codenamed “J98” and “J99”. Hints of the feature are buried deep within iOS 8, according to the report. The split screen would enable users to have two apps side by side or one app with two different views. The screen can be split into 1/3, ½ or 2/3 views. Although it is highly likely to surface in iOS 9. Digitimes has said the larger iPad Pro will be running both iOS and OS X as operating systems – although this seems a long shot. What is more likely is multi-user support finally heading for iOS. This is something that has been on Android for a number of years now, so given Apple’s propensity to gain inspiration from its rivals, this could be appearing with iOS 9 and the iPad Pro. The larger tablet could also sport Force Touch, which made its first appearance on the recently updated MacBook and Apple Watch.